The bill sent back for revision. Verkhovna Rada on 2 June returned the draft law that provides for the introduction of quotas for Ukrainian songs in the radio broadcast, to the committee for preparation for another first reading. After a vehement debate and low support, 245 deputies voted for the bill to be sent back for revision. 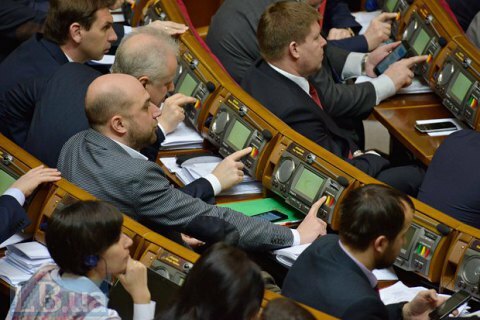 The bill 3822 envisages that the share of songs in Ukrainian in radio air should not be less than 35% of the total air time in a day and in time intervals from 6.00 to 12.00, from 12.00 to 18.00, from 18.00 to 24.00. It is also proposed that national audiovisual product should occupy at least 50% of airtime. The bill suggests that during the first year after the enforcement of its enforcement, the quota shall be set at 25%, the second year - 30%, from the third year - 35%. Under the current law On Television and Radio Broadcast, the interests of the national TV and radio product is guaranteed by the norm at least 50 percent of airtime should be given to the national audiovisual product or musical works of Ukrainian authors or performers. The bill 3822 was aimed to amend this norm.